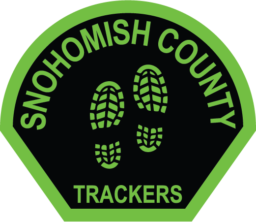 The Snohomish County Tracker Team is composed of volunteers and Law Enforcement personnel who are dedicated and highly trained to perform urban and wilderness search and rescue operations and assist with crime scene investigations in Snohomish County, Washington. 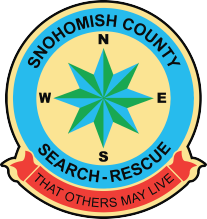 In partnership with other elements of Snohomish County Volunteer Search and Rescue, the Tracker Team is on call 24/7 to assist the community under the authority of the Snohomish County Sheriff’s Office. Living beings moving through an environment leave evidence of their passage, known to trackers as Sign. Tracking is the art and science of identifying and interpreting sign. Identifying: Trackers find evidence of the subject’s passage through terrain first by finding the sign, then by determining whether the sign was made by the subject, another human, or by natural causes such as animals or weather. This skill only comes about through extensive training and experience. Interpreting: Once the subject’s sign is identified, additional value is gained by determining where the subject was going, what the subject was doing, and how long ago the sign was made. To join the Tracking Team, you must first join Snohomish County Volunteer Search and Rescue, and maintain an active membership in one of their designated units. As such, they must be ready to be deployed into wilderness areas with mission-ready packs and equipment; and be fully trained in communications, navigation, survival, first aid, and all other Department of Emergency Management required Core Competencies. ALL Search and Rescue personnel are encouraged to become familiar with the fundamentals of tracking, even if they are not inclined to devote themselves to be members of the team, because familiarity with the capabilities of tracking allows them to be alert for the presence of sign themselves. Even if they are unable to follow the sign for long, at least they will learn not to trample it, which makes life easier for the tracker team. Tracking is difficult, but not magic. The learning curve is steep, and the hard-won knowledge evaporates without regular practice. The old adage “if you ain’t training the knowledge is draining” applies. Missions often take place in the rain, snow, dark, and in rough bug-filled terrain; so training can too. This requires discipline and focus for hours at a time. The ability to work as part of a team is vital. While hard, tracking is greatly rewarding, both communally and personally. Unit members who are interested in joining the Tracking Team must attend meetings, and pass the initial training class. Trackers can then attend an in-house training program, led by Bob Brady, one of the foremost recognized tracking experts in the United States. Trackers are encouraged to seek certification through approved outside professional tracking schools, such as Joel Hardin Professional Tracking Services, or the Universal Tracking Services programs. Once an appropriate level of certification is achieved, members of the Snohomish County Tracker Team can be called in by the Snohomish County Sheriff’s office to assist with crime scene investigations. Trackers can interpret sign at crime scenes, write reports, and testify at trials as expert witnesses. Snohomish County is blessed with abundant wilderness areas, among the most beautiful and rugged in the country. With this blessing, unfortunately, comes the reality that people enjoying it sometimes get lost. Tracking is one of the tools available to Search and Rescue volunteers to find them. In addition to wilderness searches, Trackers can operate in urban areas in searches for missing children and Alzheimer patients. Tracking teams can start at the Point Last seen (PLS) or Last Known Point (LKP) of the lost subject and through identification and interpretation of sign determine a direction of travel, aging, and possibly even the location of the subject. Trackers often work in three-person teams, consisting of a point person and two flankers. Trackers can work alone, or in conjunction with other teams, such as K-9, ground searchers, swiftwater, 4×4 or helicopter teams. 01.30.2015 – Snohomish County Man Whose Hunted Terrorists, Now Heads Local Team of Man Trackers.